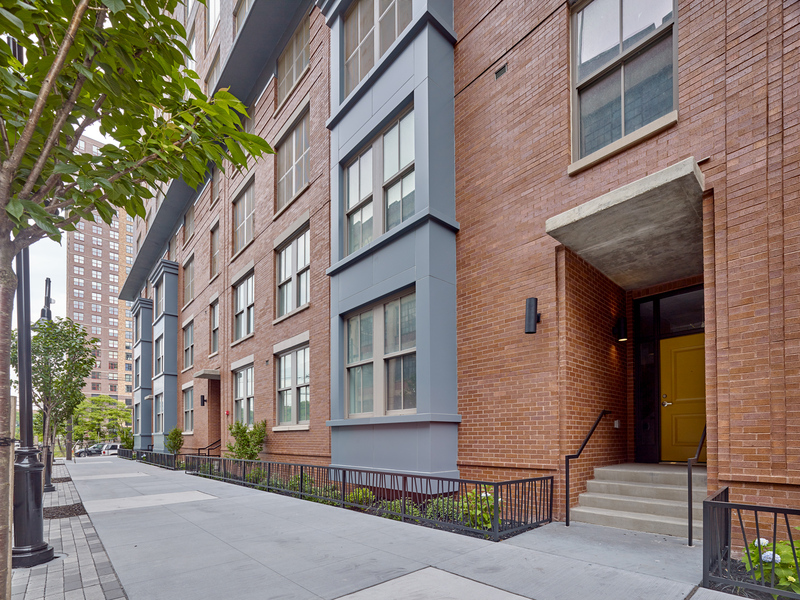 The Beacon, a residential community built on one of the highest points in Jersey City near its vibrant downtown district, is inarguably unique—in its history, its architectural distinction, its scope of amenities, and its unparalleled offering of outdoor open space. The amenity package alone is so broad and vast it belies the gated community’s urban setting. There’s Overlook Park, a 45,000 square-foot, landscaped oasis offering grills and seating areas against the panoramic backdrop of the Manhattan skyline and New York Harbor; an additional two-acre park with children’s playground and organic garden spaces, and expansive dog runs for the resident canines. There’s more: 24-7 state-of-the-art fitness centers, meticulously restored Art Deco theatres with oversized screens, children’s playrooms, high-floor Sky Lounges, WiFi in common areas and landscaped courtyards with fire pits. Residents also engage in Yoga classes, Spin classes, children’s music classes, holiday events and assorted food truck festivals—all while enjoying majestic views in every direction including Liberty State Park, the Statue of Liberty and Manhattan’s iconic skyline, Additional community amenities include on-site garage parking, 24-hour Community Concierge, and Smart Key controlled access. The Beacon’s ornate buildings are icons themselves—restored to recapture the dramatic architectural details and historic grandeur of their Art Deco-era origins. Today, six buildings are completed, their marble walls, terrazzo floors, etched glass, gilded beams and moldings, and bronze chandeliers gleaming as they did over 75 years ago. Inside the newly-created rental residences, the look is modern and chic. Studios, one- and two-bedroom apartments feature high ceiling heights and gourmet chef’s kitchens with granite countertops, stainless steel appliances and garbage disposals. Elegant baths are adorned with cultured marble vanity tops, tile floors and glass shower doors. Each residence also offers central heating and air conditioning and individual washers and dryers. Individuality and a broad range of options reign supreme at The Beacon. Paramount, which like alI of the Beacon buildings is named after a famous theatre, rises 23 stories and features some of the most dramatic spaces and distinctive architectural elements found within the residential collection. Its voluminous two-story lobby—with 12 marble columns and a grand stairwell of white and gray marble that leads to a spacious marble-trimmed mezzanine—has been featured in several movies including The Imposters and Quiz Show as well as in Avri Lavigne’s music video for the song “Hot”. Tower, a 1 5-story, 128-unit building, is 100% smoke free and pet free and includes a landscaped Zen Garden with comfortable seating and fire pit, and a 15th-floor Sky Lounge in its amenity offering. The recently-launched Criterion features 271 luxury apartments, a beautifully-adorned lobby, and its own suite of amenities tailored to today’s urban professionals. The wide assortment of floor plans, views, amenities and aesthetics has enabled developer Building and Land Technology (BLT) to deliver a modern, urban lifestyle experience at The Beacon that caters to every need and indulgence. The developer’s commitment to service is further demonstrated through exclusive transportation benefits to Beacon residents, including high-frequency courtesy shuttle service to the Grove Street and Exchange Place PATH/Ferry Stations. Beacon residents also enjoy proximity to Jersey City’s vibrant downtown district which is celebrated for its comprehensive public transportation system, including numerous NY Waterway Ferry terminals and PATH stations offering convenient service to Manhattan, as well as NJ Transit Light Rail and accessibility to the Holland and Lincoln Tunnels. The area is also flourishing with new restaurants, cafes, coffee houses and cultural attractions. For more information: www. thebeaconjc.com.